Who doesn’t love the Easter Bunny? 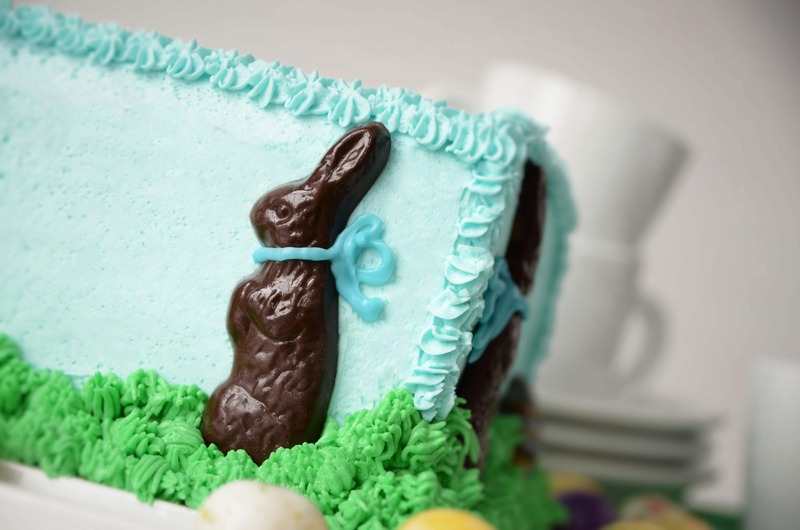 Make this hippity-hoppity Chocolate Easter Bunny Cake from scratch for your Easter celebration! 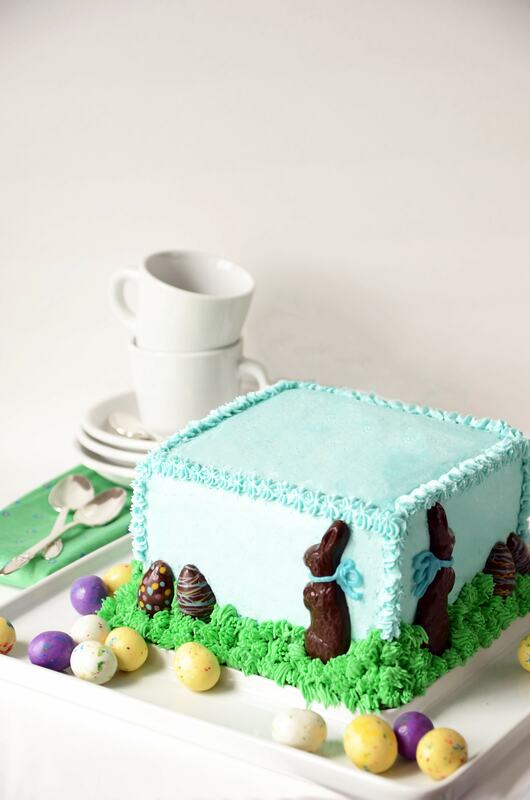 How cute is this Chocolate Easter Bunny Cake? 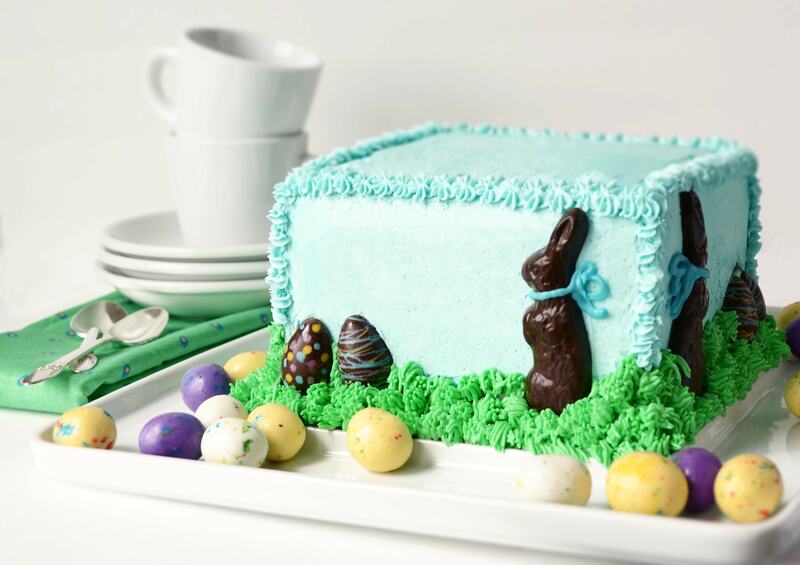 Bunnies are a theme in our household, so Easter just isn’t complete without bunny confections. I mean, who doesn’t love the Easter Bunny? So, this year was no different. That hippity-hoppity guy graced our holiday dinner table once again. Many moons ago, I found a pile of Easter themed chocolate molds at a yard sale. I don’t remember what I paid, but I know it wasn’t much. Over the years I have used most of the molds, but this rabbit chocolate mold kept getting passed over. Really unfair to pass over such a handsome hare, right? So this little guy was the inspiration for the cake. He reminded me of the large hollow chocolate bunnies that came in my Easter basket as a child. Mr. Rabbit longed for a hop in the tall Spring grass, so I designed a scene for him. Luckily, I found a vintage Easter chocolate mold kit at the thrift store recently. The kit was in sorry condition other than two 3D chocolate molds, one for a rabbit (you’ll see him in the future) and one of plain eggs. Reluctantly, I paid $3 for the box but it was worth the investment since my other chocolate egg molds were too fussy for the design I had in mind. 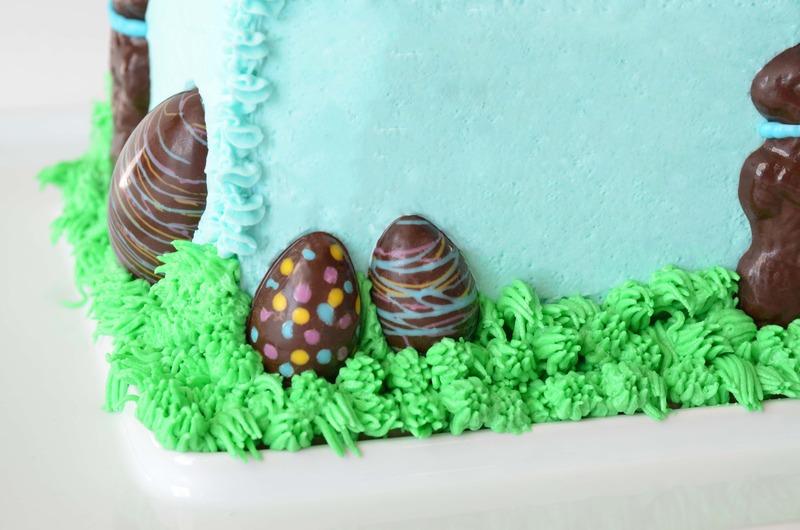 I used colored white chocolate to create dots and lines on the eggs before filling them with luscious dark chocolate. Being an overachiever, I decided to make this cake a checkerboard cake… time consuming? Three days later…the answer is a definite yes. But it was impressive when we cut it open, revealing bright cubes of yellow, aqua and lilac. Sorry there aren’t pictures of the inside, but our dinner companions were anxious to dive in, so no mid-dinner cake photo shoot. I can’t blame them because it tasted as good as it looked thanks to this white cake recipe. Side note- The “cake” plate is a cheese platter. I had picked out a rectangular plate in advance, but it was longer than my cake pans. This is what I could find that fit the size of the bunny and my pans. Necessity really is the mother of invention. Make your chocolates ahead of time and store them in an airtight container in a cool, dark location. Short on time? Use ready made chocolates from your local candy shop or grocery store. 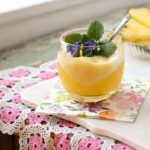 Most cakes can be made in advance, wrapped tightly in plastic wrap and then frozen, but make sure to frost and decorate your cake no more than 24 hours before serving, so it looks and tastes fresh. Once decorated, keep your cake at room temperature and not in the refrigerator since chocolates are sensitive to cold and humidity. 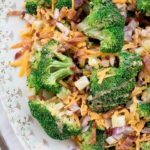 Homemade bacon and mayo dressing with a hint of cayenne kick renders this broccoli salad unforgettable! It makes ordinary steamed broccoli everyone’s favorite vegetable! 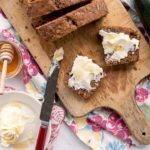 This easy recipe for Zucchini Bread has a tender crumb and loads of home baked flavor. It tastes just like mom pulled it out of the oven! I love the photos of that cake. It looks so good.